>A few weeks ago I started hinting of some changes here at blueadt house and now I can finally reveal whats been going on. 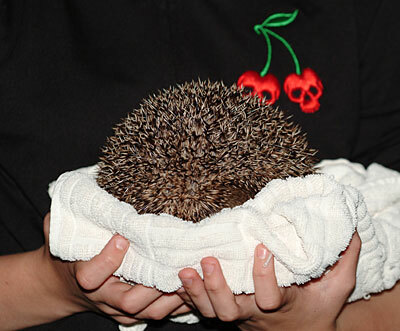 He was taken into rescue in June ’06 weighing just 3oz & suffering from a variety of ailments including lung worm. Now a healthy 4lb he’s strong enough to go back into the wild or rather the bottom of our garden. He’ll have the freedom to come & go as he wants with the added advantage of fresh food & water delivered every evening. DH has made him a special house & it’s carefully hidden under plastic covered in a mountain of leaves in a corner under a large bush sheltered by fencing. We’re hoping that he doesn’t ‘leg it’ & that he choses to stay in his house snug in all the leaves. The bottom of our garden is quite overgrown & home to squirrels in the trees, mice & lots of birds including Tawny owls. Hopefully he’ll fit in well & make it his home. 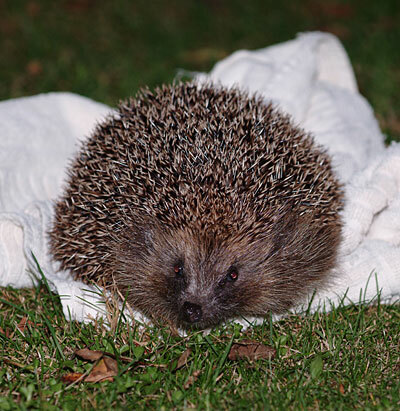 >There’s something so very appealing about hedgehogs :-)I do hope he feels at home in your garden. >awwwwww, he’s so cute!!!!!! Will the dogs leave him alone? I think Scooby would probably fetch him in to the house:-0) I’m sure he’ll decide to stay when he sees his new house! I’d love to have wildlife at the bottom of my garden……. >Oh isn’t he a cutie? >wow! how do you get a hedgehog? 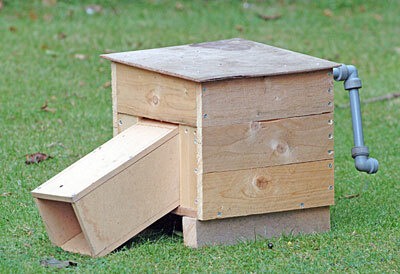 we’re after a breeding pair for our veg patch, and bill could build a hutch like that no problem. i hope he has a long and happy life in your garden. our dalmatian would bring us hedgehogs, but he never harmed them. 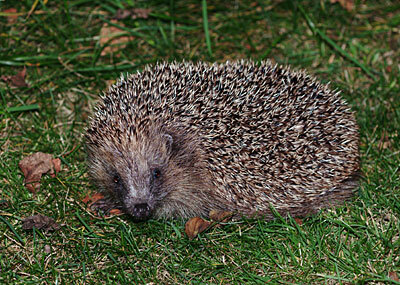 >Welcome to the new family member, Spike, and hope he settles in well at the bottom of the garden! >Oh he is wonderful, we loved having our little friend last year. If you hear of any others needing a home let me know.